Hello, happy weekend! Hope you get some time to do what you enjoy. I made this little card for our Granddaughter. She had a little graduation program at school yesterday. She is leaving elementary school for middle school. She received several awards and certificates. The most prestigious was the Principals Award, chosen by the three 6th grade teachers and the principals, awarded to the student that they believe is the best of the best. She also received the President's physical fitness trophy for having passed the physical fitness standards set forth, every year since the third grade when they first get tested. She was the only student to receive the trophy and only a few students before her have achieved this award. She received awards for All City Band, Music (she plays the clarinet), among others. Megan, Nana and Papa could not be prouder of the young lady you have become. You are going to shine at Middle School! Enjoy every minute, it all goes by very quickly. This picture was taken a week ago. 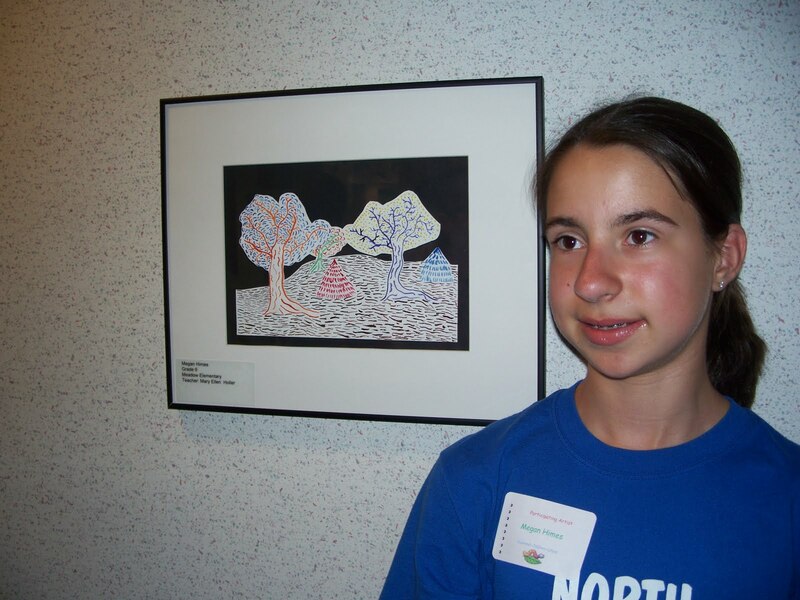 Megan entered an Art contest through school. The art is hanging in the offices of a local pediatrician's office (just happens to be the doctor the children go to!) Her art was chosen along with about 25 other young artist and they framed and hung them all and had a little reception to honor the students. Here she is standing next to her art. The image on the card is from Sassy Cheryl's. The sentiment is by Paperbag Studio. You must be so proud! She's going to love this card that you have made her. It's wonderful and happy!!! Goodness, she is so accomplished already and not yet in middle school! Looking at her artwork, she appears to be talented like her grandma Sue!!! Congrats and hugs to you and your granddaughter! So gorgeous card Sue,i love the image and the colours. You must be so proud...the card is perfect for her! She is going to love your homemade card from you SOOO much! I think she takes after her grandma, with her artwork!!! How sweet! You must be so proud! Thanks for sharing her story. 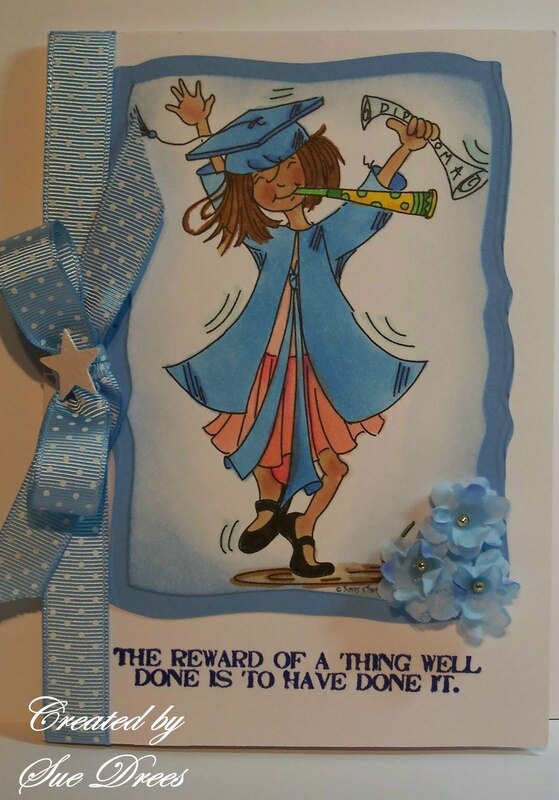 Fabulous graduation card - our kids don't graduate until the end of the year - we go January thru December for our school year! But my son is moving onto High School next year so I may have to check out a card for him then! Bet you are sooo proud of your granddaughter - looks like she has your talent! Congrats to your talented granddaughter! Our Julia get´s her year report next friday--- we will see..
It´s so fantastic if kids love their teachers and the school... we are thankful that we have choosen the right school for our girl! 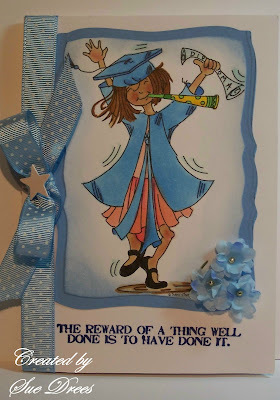 hugs dear Sue ..fantastic card for your talented girl!!!! Sue, I can see why your are so proud, she is an amazing student, so many outstanding awards. She obviously takes after you with her good looks and your talent. Oh so proud -- and for good reason! She is a real gem and your card is fantastic and will be treasured by your sweet granddaughter. Tim Holtz Class Project Finished!! !